Cornell Tech - Trusting Autonomous Cars: How Much Is Too Much? Trusting Autonomous Cars: How Much Is Too Much? Hannah Xue doesn’t know how to drive. So when Xue, an engineer with a background in psychology, began pursuing the Technion-Cornell Dual Master’s Degrees in Connective Media last year, she never expected her master’s specialization project would revolve around cars. But then she met Zaid Haque. Haque, Connective Media ’17, on the other hand, is a transportation junkie. “I’ve been in the field of cars and planes for a while,” said the interaction designer. After graduating from Carnegie Mellon’s Qatar campus, he went to work first at Williams F1 Racing, followed by a three-year stint at Qatar Airways. “I’m really into all of the new stuff that’s going on in the car industry,” he said. That “new stuff” encompasses one of the most disruptive forces in the automotive industry today: autonomous (also known as driverless) cars. Although Haque and Xue hadn’t worked together in their first semester at Cornell Tech, they knew of each other’s skills and experience. So, when winter break rolled around and they had to select partners to create a specialization project — a necessary component of the Connective Media program at the Jacobs Technion-Cornell Institute — they decided to join forces. 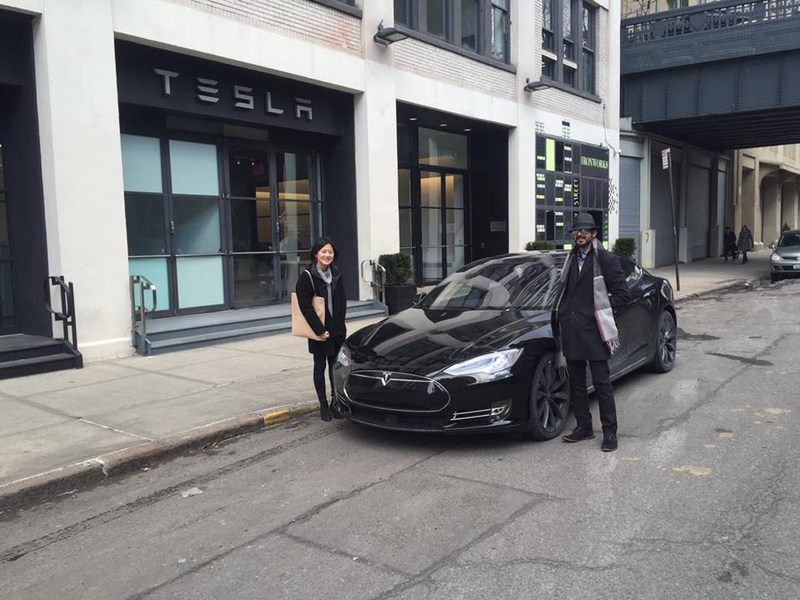 Hannah and Zaid after test “driving” a Tesla on autopilot for research. Namely, what will the relationship be like between drivers and autonomous cars? Will humans be able to trust machine decision-making on the road? And to what extent should we trust such a vehicle when the consequences of a single miscalculation or technical malfunction could be tragic? In approaching these questions, Xue’s unique perspective — in particular, her knowledge of behavioral psychology — proved to be a boon. Behavioral psychology, Xue explained, often considers questions of how and why people trust each other. Might her team transfer that human-to-human framework to better understand the relationship between humans and machines? So they decided to see if an act of synchrony could also impact the trust and teamwork dynamic at play between a person and a driverless car. Xue and Haque did this by outfitting people in Google Cardboard headsets to simulate a ride around the city. Before the car started, participants had to play a Guitar Hero-like game in which a circle appeared on a screen at a set rhythm. When the car and human pressed (or “strummed”) the button in sync for a set period of time, this synchronous pulse would start the car. During the experiment, Xue and Haque put the simulated car into situations where there was risk of an accident because they wanted to measure how quickly humans reacted — by turning the wheel, for instance, or pressing the brakes. “We didn’t want to manipulate a driver’s trust in the car, but to calibrate it,” Haque said. At first, they hypothesized that increasing the level of trust between person and machine — e.g., by having them participate in the Guitar Hero-like game — was a good thing. They wanted people to be comfortable in a future where vehicles will drive humans around, not vice versa. But then, midway through their experiment, a fatal, highly publicized accident involving an autonomous car took place in Florida, obligating Haque and Xue to rethink their initial hypothesis. Xue and Haque decided that instead of only having passengers engage in synchrony to start the car, passengers should be required to do so at multiple points during the ride. Keeping passengers engaged would hopefully increase their reaction time in the event of a dangerous situation. As driverless cars continue to make national headlines, Haque and Xue finalized their project last semester by creating a product based on their findings: a device that can calibrate a driver’s trust in the vehicle. They are now considering taking their project one step further, by refining and expanding their product scope to participate in Cornell Tech’s Startup Studio this spring.